We are an American political party, uniquely formed as a true, constitutional movement, reaching out to all who seek a secular government as outlined in the First Amendment to our United States Constitution. Our mission: To politically represent U.S. atheists and all who are drawn to our mandate, in a political process that has thus far marginalized and ignored one of the largest and growing segments of the U.S. population. The National Atheist Party is a diverse, all inclusive, progressive, secular political movement and a response to the lack of representation for all free thinking people who are legal, law abiding citizens of the United States. We demand emancipation from the religious dogma that has infiltrated our government and has unfairly influenced political decisions and policy making. We are for the people, by the people, and therefore incorporate the right to use the power of the people to restore equality to our Democracy using reasonable, rational and non-violent means. Check it out, http://www.usanap.org/documents/charter.html/ Very humane and logical. After a week in which journalists and police clashed at Occupy Wall Street and related events around the country — and the NYPD arrested 12 reporters — leaders like New York Mayor Michael Bloomberg are starting to feel the heat. Our campaign demanding that all mayors defend the First Amendment and rein in these attacks was featured in today’s New York Times. So far 30,000 people have joined our action, urging all mayors to protect journalists’ right to free speech. If you have not added your name yet, please sign our petition today. We’ll be delivering them soon. Once you take action, check out the New York Times article and share it with your friends. This is a fight for the freedom of our press — let’s keep the pressure on. Mayors: Protect Press Freedom in Your Cities. Early Tuesday morning, the New York Police Department forcibly evacuated Zuccotti Park, home of the Occupy Wall Street movement. The move provoked a clash not only with protesters but with the press. In what appears to have been a coordinated effort to block coverage of the raid, the police barred many journalists from reporting on the police action. If the mayor of our country’s largest city thinks protecting the press means silencing them, we’re in big trouble. And he’s not alone. Police harassment of the media has been reported during “Occupy” protests in Chicago, Denver, Oakland, Portland and beyond. Arrests of journalists continued throughout the week as protesters took to the streets nationwide. It’s time to tell mayors across the country to uphold our press freedoms. Tell Mayor Bloomberg and the U.S. Conference of Mayors to publicly commit to defending the First Amendment and letting journalists do their jobs. The NYPD is using more than words to fight journalists. Since Tuesday, 13 reporters have been arrested, another was put in a choke hold, another was beaten with a baton and others were subjected to police harassment. In fact, since the birth of the Occupy Wall Street movement two months ago, 26 journalists have been arrested2, 3 and countless others have been roughed up, tear-gassed and pepper sprayed. There have even been reports of police using high-powered strobe lights to disable video cameras and block people from recording their actions. 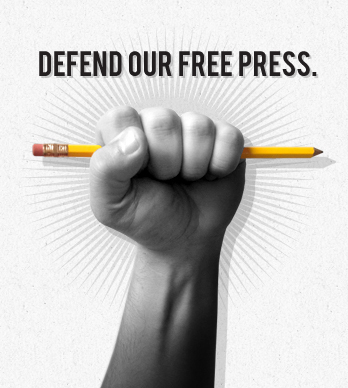 Demand that all U.S. mayors publicly commit to protecting freedom of the press. Please sign this action and we will deliver your letter to Mayor Bloomberg and the Conference of Mayors and demand that they drop all charges and make this crucial commitment to upholding the First Amendment. Please take action right now. P.S. Great news: If we raise $300,000 by Dec. 31, 2011, two longtime supporters will kick in an additional $300,000. Donate today and your gift will pack double the punch in the fight to protect the First Amendment and journalists everywhere. Thank you! Thousands of protesters march in Athens as capital comes to a standstill ahead of vote on latest austerity measures. Thousands of protesters have marched in the Greek capital Athens at the start of a two-day general strike, as parliament prepares to vote on sweeping new austerity measures designed to stave off a default that could trigger a crisis in the wider eurozone. Police were deployed in force in central Athens on Wednesday as protest marches began, blocking a road by parliament and shutting down two nearby metro stations. At least 3,000 officers were stationed around the city, with additional forces guarding possible targets of violence such as embassies and government buildings. Most of the country’s professional classes joined the walkout, including civil servants, tax collectors, doctors and teachers. Taxi owners, petrol station operators and bakers also shut down their businesses in protest against the government’s economic policies. Flights were grounded in the morning after air traffic controllers staged a 12-hour work stoppage. Piles of rubbish continued to fester on street corners despite a civil mobilization order issued on Tuesday to order rubbish collectors back to work after a 17-day strike. Civil servants have staged rounds of sit-ins at government buildings, with some, including the finance ministry, being under occupation for days. “We expect that the strike could be the largest” in decades, Ilias Vrettakos, deputy president of the civil servants’ union ADEDY, said. People in more equal societies live longer, have better mental health and are more socially mobile. Community life is stronger where the income gap is narrower, children do better at school and they are less likely to become teenage parents. When inequality is reduced people trust each other more, there is less violence and rates of imprisonment are lower. If we want to build a better society, it is essential we take action now to reduce the gap between rich and poor. In rich countries, a smaller gap between rich and poor means a happier, healthier, and more successful population. Occupy Wall Street: How long can it last?